Katherine Sherwood’s acclaimed mixed-media paintings gracefully investigate the point at which the essential aspects of art, medicine, and disability intersect. Her works juxtapose abstracted medical images, such as cerebral angiograms of the artist’s brain, with fluid renderings of ancient patterns; the paintings thus explore and reveal, with a most unusual palette, the strange nature of our time and current visual culture. In addition to showing regularly throughout the United States, she co-curated the exhibition “Blind at the Museum” at the Berkeley Art Museum, and organized an accompanying conference at University of California, Berkeley. 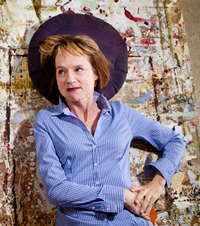 Sherwood was a recipient of a Guggenheim Fellowship in 2005 and a Joan Mitchell Foundation grant in 2006. Her work was included in the Smithsonian Museum’s “Revealing Culture” and at a solo show at Gallery Paule Anglim, San Francisco in 2010. Sherwood is a professor at UC Berkeley in the art department and the Disability Studies Program. She is the artist-in-residence at the Helen Wills Neuroscience Institute and the co-founder of the art and disability collective - The Yelling Clinic.